Grill burger to medium and layer everything on top. You may need a skewer to hold the Urlacher Burger together. Recipe found at Tasty Tailgating Recipes For Bears Fans. Recipe by David Maish, founder and chef of David’s Bistro in Des Plaines. Mix all ingredients together in large bowl and serve chilled. If you like it a little creamier, use less milk and a little more mayo. Soak ears of corn for 10 minutes in water, leaving the husks on. Place on grill and cook about 20 minutes. Turning every 5 minutes. Once corn is done melt some butter and add 1 teaspoon creole seasoning for every stick of butter used. Shuck your corn and dip in butter. For a sweeter coach cob substitute the creole seasoning with 1 tablespoon honey. In a medium-size saucepan, heat the half-and-half, milk, chicken base, Tabasco, and seasonings to a simmer. Remove from the heat and keep warm. In another medium-size saucepan, heat the butter over medium heat. Add the flour and whisk well to combine. Cook this mixture for 2 to 3 minutes, stirring often. Slowly whisk the heated milk mixture into the butter mixture, a little at a time, whisking constantly until smooth. Bring the mixture to a simmer and cook for 5 minutes, stirring constantly, until it thickens. The sauce will be very thick. Stir in the spinach and simmer for 5 minutes. Adjust seasonings. Serve while hot. *Note: Granulated garlic is dried granular garlic, not the same as dried minced, dried chopped, or garlic powder. It has the best flavor of all the dried garlic products, in our opinion. Some supermarkets carry it in the gourmet spice section, and it’s available from spice shops. **Variation: To make the recipe with fresh spinach, you will need 4 (10-ounce) bags trimmed, washed spinach (not baby spinach). Working in four batches, wash one bagful of spinach at a time in a basin of cold water. Drain in a colander. Place the batch in a 6-quart pot over high heat, cover, and steam. While the spinach is steaming, repeat the process for the other three bags, putting each on top of the spinach in the pot (it will shrink down considerably). Cover and steam until the spinach is wilted and cooked. Drain in a large colander. Press down on the spinach with a spatula to extract as much as possible. Transfer the spinach to a cutting board and chop finely. Line the colander with a lint-free, clean kitchen towel. Put in the chopped spinach, bring up the ends of the towel, and, as soon as it’s cool enough to handle, twist the towel to form a sack and squeeze dry. You should have 2 1/2 cups of cooked, chopped, squeezed spinach. Stir the spinach into the cream mixture and simmer for 5 minutes, stirring to mix. Adjust the seasonings. Serve hot. Preheat oven to 350°F (180°C). Sift together the flour, salt, sugar, and baking soda. Mix the pumpkin, oil, eggs, 1/4 cup of water, and spices together, then combine with the dry ingredients, but do not mix too thoroughly. Stir in the nuts. 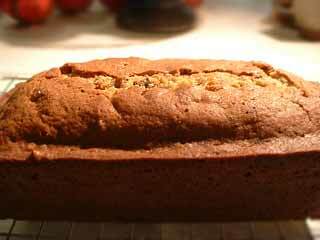 Pour into a well-buttered 9x5x3 inch loaf pan. Bake 50-60 minutes until a straw poked in the very center of the loaf comes out clean. Turn out of the pan and let cool on a rack. My grandmother was born in Ireland, and as such, I had Irish Soda Bread all the time as I grew up. She also called it Johnny Bread. I love to have this with some tea. Makes all my troubles go away! Enjoy! 1 Preheat oven to 425°. Sift together the flour, sugar, salt, and baking soda into a large mixing bowl. 2 Using a pastry cutter or two knives, work butter into flour mixture until it resembles coarse meal, then stir in raisins. 3 Make a well in the center of the flour mixture. Add beaten egg and buttermilk to well and mix in with a wooden spoon until dough is too stiff to stir. Dust hands with a little flour, then gently knead dough in the bowl just long enough to form a rough ball. If the dough is too sticky to work with, sprinkle in a little more flour. Do not overknead! Transfer dough to a lightly floured surface and shape into a round loaf. 4 Transfer dough to a large, lightly greased cast-iron skillet or a baking sheet. Using a serrated knife, score top of dough about 1/2” deep in an “X” shape. Transfer to oven and bake until bread is golden and bottom sounds hollow when tapped with a knife, about 35-45 minutes. Check for doneness also by inserting a long, thin skewer into the center. If it comes out clean, it’s done. Transfer bread to a rack to let cool briefly. Serve bread warm, at room temperature, or sliced and toasted. Note: I use a regular casserole dish to bake it in and it turns out fabulous! Welcome to my blog about cooking and recipes. I love to cook and want to share with everyone! Feel free to send in your favorite recipe!